I’ve made low-carb pizza approximations in the past, and they’ve been ok, but not pizza-like enough to truly fool me into believing it was pizza. This recipe, however, is very convincing. The crust is even robust enough to pick up and eat like a pizza that has a traditional bread crust. 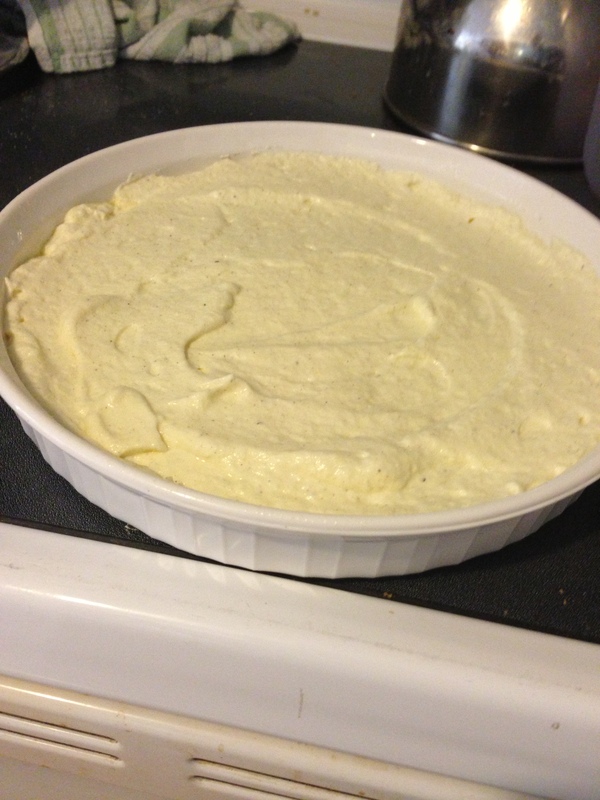 Grease a 10″-12″ deep dish pan very well. 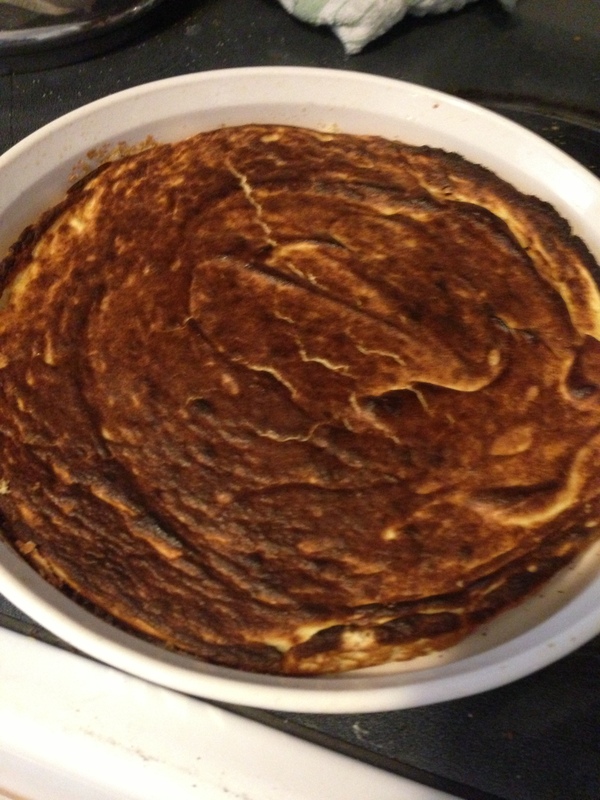 I used a 10″ Corningware quiche/pie plate. A small jellyroll pan would probably work, as well. Whatever you use, just make sure to coat it thoroughly, including the sides. Separate the eggs into two bowls. Add the cream of tartar to the whites, and add the ricotta cheese and garlic salt to the yolks. Whisk the egg whites until stiff peaks form. (Your bowl and whisk have to be clean or the whites won’t set properly) Mix the ricotta and yolks until well blended, then carefully fold them into the egg whites, just until blended. This will give you a fluffy batter. Pour the batter into the prepared pan, and spread it out evenly. 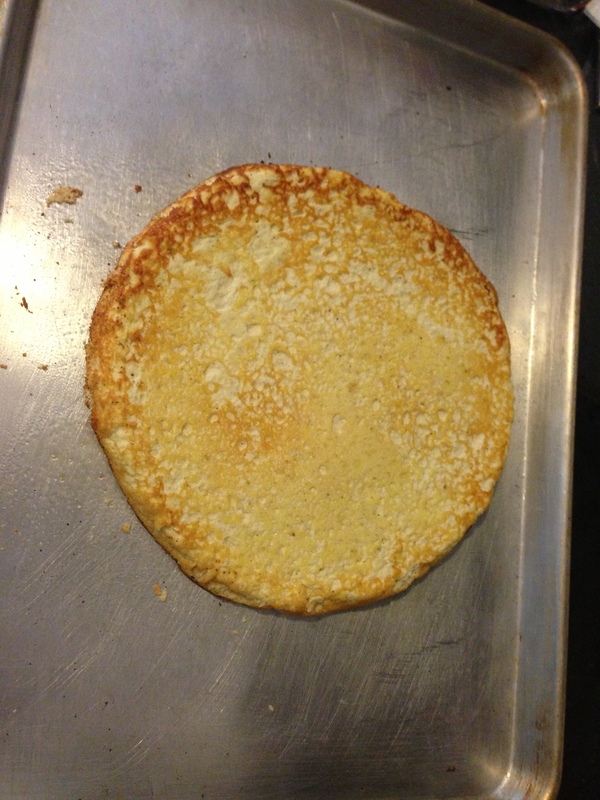 Bake for 20-25 minutes, until the edges are just starting to turn golden brown. Next, put the crust under the broiler for 2-3 minutes to brown the top, but watch it THE ENTIRE TIME. It can over-brown really fast (as you can see from the picture). Take it out of the oven and let it cool a bit. If you want to make more than one pizza, make another crust while the first is cooling. While the crust is cooling, add all the sauce ingredients to a small saucepan and heat over medium heat. The spice measurements are an approximation, as I don’t really measure them. Go light on the oregano, and heavy on the basil and garlic. You don’t need to cook it for very long. Just heat it up and season to taste. One batch of sauce will cover 3-4 10″ pizzas. When the crust has cooled down, run a knife around the outside to make sure it’s loose. Grease a baking sheet and turn the crust out on to the pan. It should come out easily. If you want, you can leave it in the original pan, but having it on the flatter baking sheet makes it a lot easier to slice. Cover the crust to the outside with sauce, and add cheese and toppings. 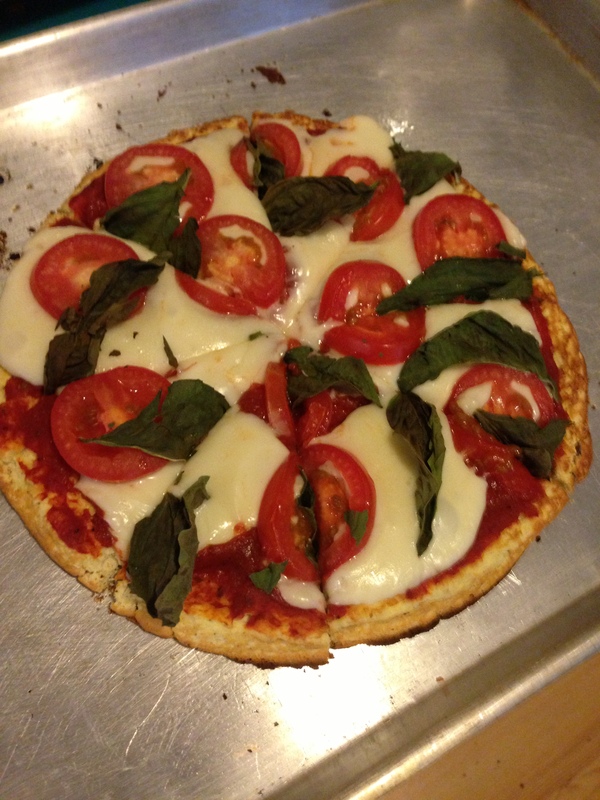 A traditional pizza is just sliced mozzarella, sliced tomatoes, and whole basil leaves. You can also use shredded cheese and anything you’d normally eat on a pizza. Bake for 10-15 minutes until the cheese is melted. Cut into 8 slices. They may seem like small slices, but the smaller size makes it easier to pick up and eat. The entire crust has 680 calories and one 1/3 of the sauce has 100 calories. Beyond that, you’ll have to keep track of the calories from the toppings you choose.